An IOC evaluation commission visited each of the three cities and issued a report assessing the bids a month before the final vote. It is the fewest number of bids to stage a Winter Olympics since 1981, when three finalists competed for the 1988 Olympics. Calgary eventually took that prize. 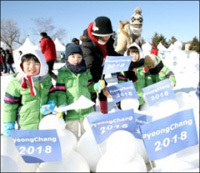 Pyeongchang - located in the Alpensia Mountains east of Seoul - narrowly lost out to Vancouver for the 2010 Olympics and to Sochi, Russia, for the 2014 Games.